Imagine a wild west that isn’t just full of cowboys and outlaws, saloon girls and gamblers. Imagine a wild west that isn’t just cacti, tumbleweeds and rolling desert as far as the eye can see. Imagine a wild west of mechanical horses, mutant killer plants, flying dinosaurs, headless indians and fearsome zombie gunslingers hell-bent on revenge. Imagine the Weird Wild West. Six colourful characters, some not entirely human, embark on a perilous journey south from Sunbleached Plains to Kellyville. A dapper dentist, a southern belle, a wealthy madam, a retired banker turned gambler, an orphaned boy and a travelling body-parts salesman all trade their various stories to pass the time. Driving the carriage is one Zeke “the Freak” Sarandon, a retired soldier with more than one strange, nervous habit. Although he is an experienced traveller, and the only one insane enough to take the most direct route south, even he cannot prevent his passengers from each meeting their grisly demise, one by one. 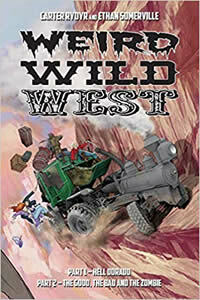 Hot on the trail of the coach, astride an ancient mechanical horse blowing sparks and belching out toxic clouds of smoke, is a zombie gunslinger, the risen corpse of a murdered prospector. For on the carriage is the one who killed him, and he must have his horrible, bloody revenge.